As part of the Homeless Connect Project in Thurston County last Thursday, the Thurston County Medical Reserve Corps was activated to provide some medical services. The request came from the City of Olympia last month as they were planning the Project Homeless Connect. The annual homeless census is done in communities throughout the US on the last Thursday in January each year. This year, several agencies and service programs were asked to join in the effort to provide additional services for the homeless when they came in to be counted. On a rainy January morning, people in yellow and blue vests were walking around 8th and Franklin downtown as the first group of homeless adults and families queued up to enter the First Christian Church. A portable warmer and several tents were set up on the street. Inside, hot biscuits and gravy, coffee, juice and a warm place to sit surrounded tables set up by social service agencies offering: housing, veterans, mental health and youth programs. Next door at the Temple Beth Hatfiloh, a separate group of volunteers turned the activity room into a make-shift service center for vision, dental and medical screening. Near the exit was another referral and resource group to help folks navigate their way to the health care services they needed. One of the volunteers gave us all a gentle reminder during our initial briefing. “Just remember that a homeless person is a person, just like you and I. Treat them as you would like to be treated.” Throughout the day, more than 50 volunteers worked under the auspices of the Thurston County Medical Reserve Corps (MRC) included volunteers from the Union Gospel Mission, The Olympia Free Clinic, SeaMar Community health Clinics and the Olympia Host Lion’s Club. Services provided included vision screening, dental screening, medical screening and vaccinations for influenza and Whooping cough. Medical services were offered from 9am – 5pm and about 41 individuals were served. An Olympia service club has an annual connection to the Wenatchee Valley in the form of thousands of apples that are shipped to Thurston County, then distributed and sold throughout the region. That tradition, in its 18th year, continued Saturday as the Olympia Host Lions Club once again organized an apple-packing event at the Thurston County Fairgrounds. This was the second and final Saturday of the Lions Club Apple Project, in which Lions club members from Renton to Chehalis pitch in to pack apples in boxes for their customers. Proceeds from the apple sales largely benefit Camp Leo, a summer camp for children with diabetes, said Jan Weatherly, secretary for the Olympia Host Lions. The camp was based in Mason County last summer, but it is looking for a new location next summer because it has outgrown its current site, she said. About 100 people helped to remove the apples from the bins, then packed them into about 3,300 cardboard boxes. The boxes were donated by International Paper. The work began at 9 a.m. Saturday but was nearly complete by noon, about three hours sooner than expected. With that many people helping out, it didn’t take long for the bins to be unloaded, Olympia Host Lions Club member Pat Creighton said. “They dip into a bin and it just gets empty,” she said. The boxes of apples were sold for $30, with $10 going toward Camp Leo; the remaining amount is used to cover expenses, Weatherly said. About 150 children with diabetes typically attend the camp, and it operates on a $70,000-a-year budget. A majority of those funds come from the apple sales, she said. About 120 boxes of apples were donated to the food bank and local elementary schools. Although the Fuji is considered a durable apple, some bruised apples – though still perfectly edible – were packed into boxes for the food bank and schools. 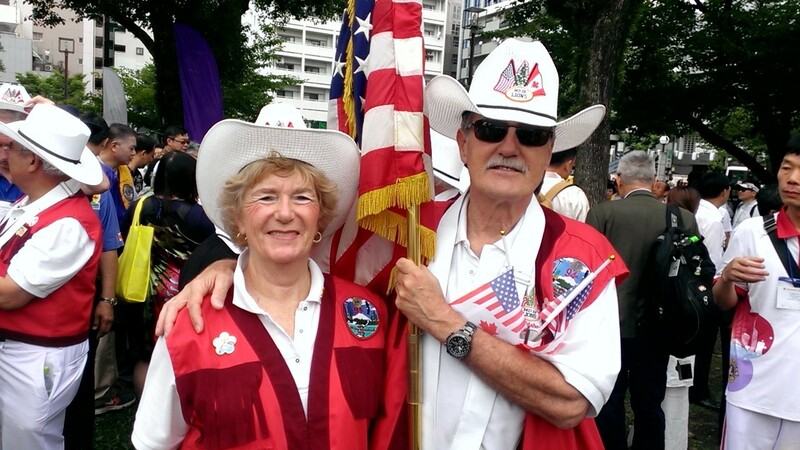 On Tuesday morning, the Lions Clubs International, which is holding a convention here, had a 3½-hour parade through downtown Seattle. There were 118 countries represented — small contingents, like two dozen Nepalese, and really big contingents, like the 1,500 Lions members from South Korea. It was advertised as the largest parade in city history. Tension. A news story should have a teensy-weensy bit of tension, don't you think? What kind of possible tension is there when 12,000 of the nicest people you could meet from all over the world have a parade? None, that's what. They smile a lot, take pictures of each other, wave flags, do some dancing in their native costumes and then smile some more. On Tuesday morning, the Lions Clubs International, which is holding a convention here, had a 3 ½-hour parade through downtown Seattle. There were 118 countries represented: small contingents, such as two dozen Nepalese; and really big contin­gents, such as the 1,500 Lions members from South Korea. It was advertised as the largest parade in city history. That would be participants, not onlookers, the latter consisting of a few hundred office workers who wandered out to watch on a nice day. This was an event not noticed by most Seattleites. A good number of those marching were middle-aged and older, and didn't look like they were in the best hiking shape. The older types tended to be from this country. Americans make up one-third of the 12,000 delegates. The parade route was 0.82 miles from Seattle Center on to Fifth Avenue and ending at the Washington State Convention Center, and this was an 80-degree day. My work desk is cluttered with notebooks, phone books, papers, mail and assorted studies and reference books, some of which haven't been opened in years. But there’s one book I use every day that never has a chance of gathering dust: my dictionary. That said, you probably can guess that I’m a big fan of the Dictionary Project, a nonprofit program designed to get dictionaries into the hands of third-grade students nationwide. In the next few weeks, the Lacey, Olympia and Tumwater Lions clubs and the McLane Grange will be in third-grade classrooms in North Thurston Public Schools and the Olympia and Tumwater school districts, deliver­ing dictionaries to all third-grade students. The Olympia Host Lions Club and four other South Sound Lions clubs joined forces a week ago to host a free community dinner. It was their first such effort and is greatly appreciated. After a successful fall apple sale that raised $10,000, the Olympia service club put $1,500 toward last Saturday's three-hour dinner at First Baptist Church in downtown Olympia. "We have a universe of abundance around us, and people need to feel that," club president Jan Norman said. Also assisting were club members from Lacey Sunrise Lions Club, the Olympia West Lions Club and members of clubs in Shelton and Tumwater. A majority of Saturday's diners were low-income and homeless residents, although the dinner was open to all residents. In this time of job losses, wage cuts and economic recession, it's heartwarming to see service clubs stepping up and reaching out to others with the offer of a free meal and a comforting word. “Never ignore the potential of a simple idea,” Olympia Host Lions Club President Jan Norman says of her club’s involvement in a nationwide health project that had its start right here in the south sound. Handwashing is listed by the national Centers for Disease Control as one of the best ways to limit the spread of disease, including the current outbreak of swine flu. Germ City, a Washington State University Cooperative Extension project on handwashing, was started in 1997 when Olympia Host Lions provided seed money to build the first prototype exhibit. “We started with three refrigerator boxes and some duct tape, but today, thanks in large part to early support from the Lions, Germ City has grown into a national program that has already reached more than a million youth and adults,” WSU Professor Susie Craig reports. Germ City programs now are active in 30 states, with some states purchasing as many as 16 units for use at schools, fairs and in restaurant staff training. The program includes curriculum, evaluation tools and support materials used by twelve universities. Germ City raises awareness of poor handwashing practices and the relationship to personal health by dramatically revealing “germs” left behind by poor handwashing techniques. Participants rub a black light sensitive lotion on their hands and view the “germs” by walking through a brightly decorated black light tunnel. After washing their hands, they re-enter the tunnel to see how well they did at removing the lotion. “The “germ” lotion has a coloring substance that shows up under the black light, allowing people to see where they missed when they washed - much like a dentist’s disclosing tablets can reveal problems with brushing, “ Craig notes. "We expected the kids to love it but adults are fascinated by the amount of "germs" left behind as well," she says. The Olympia Host Lions Club initially provided just $500 and matching in-kind support for a grant to get the project rolling. “That seed money and a lot of manpower and moral support from the Lions in those early years really gave us the impetus to get this project going,” Craig says. Partners in the Germ City project now include health departments, schools, nurses, senior citizen cen­ters, community and military facilities, fairs, 4-H, food service operations and agencies including DSHS, Head Start, Agriculture and the FDA. WSU Extension is eager to work with Lions Clubs to get the Germ City exhibit out to more schools and fairs.